Because try as you might, your cranks just don’t overlap your wheel? Unfortunately, your typical Ant+ speed/cadence sensor just isn’t compatible with laid-back cycling. Devices like the highly recommended Garmin GSC-10 rely on the fact that you can stick a sensor on the chainstay of a diamond-frame bike and it can ‘see’ a spoke magnet (for wheel speed) and a crank magnet (for cadence) from the same location. Try that on a bike where the pedals are several feet from the nearest frame member overlapping a wheel! Enter Bontrager’s Interchange range of Ant+ digital sensors, which includes two of particular note for recumbent riders: discrete speed (part #424633) and cadence (part #426479) sensors! At £25 or more apiece these sensors aren’t cheap, but however unconventional your ride you can still generate quality speed and cadence data into your chosen Ant+ computer. 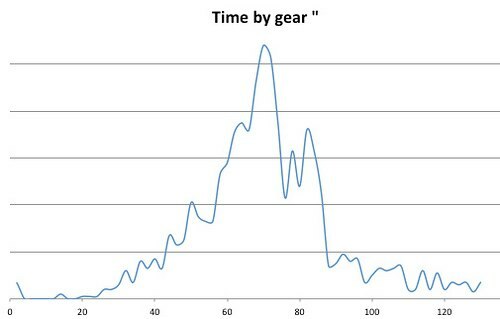 Now, take a look at the gearing (derived from speed and cadence using Excel). Can you tell when I down-shifted on the way uphill? Clearly, for this bike on this route, optimisation of the drivetrain in the narrow band between 60 and 85 gear inches is going to pay dividends. In contrast, worrying about whether the bike is geared higher than 100″ is neither here nor there, and if it’s not overly efficient at < 40″ it’s not such a big deal either (if you need to draft, YMMV). Note that because the chart is plotted against time in gear, not distance, it controls for the distorting effect of slow climbs (or screaming descents) nicely. There are a couple of niggles which are disappointing at the price: one for each sensor in fact! In constrast, the magnet which fits to the cranks is a sensible slip-on rubber ring design, a big improvement over the Garmin crank magnet which you need to hold on with a zip tie (not much good if the inside face of your cranks isn’t convex, or at least flat). Top marks… but then the cadence sensor itself requires cable ties to mount, instead of a rubber o-ring. To make matters worse it only accepts thinner cable ties than the standard ones I stockpile – cue some sweating with pliers every time I want to fit it to a bike (and then knifework when it needs to be removed). These are relatively minor quibbles, especially if swapping between different bikes isn’t a big use case for you. 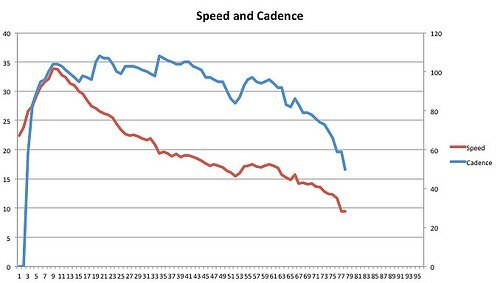 Actually having reliable speed and cadence data on a recumbent is worth the cost and hassle in my opinion (assuming you want to capture this data in the first place, of course). I once ‘solved’ this issue for myself by dismantling a GSG-10 and extending the wheel sensor with bell wire, lashing it to the fork of my RaptoBike while the main body of the sensor sat on the boom. That worked fine for winter training sessions on the turbo, but it didn’t survive more than a couple of trips in the real world. 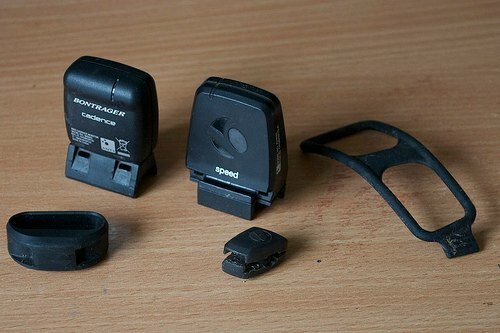 The Bontrager sensors are much better. My Bontrager cadence magnet (rubber band style) fell off when the rubber failed and snapped one day. I just went to a flat circular neodynium magnet on the inside of my pedal spindle. I have the same on my TT bike where the crank arms are chunky; it’s more aero too, and very cheap to replace if you are unfortunate enough to knock the magnet off. 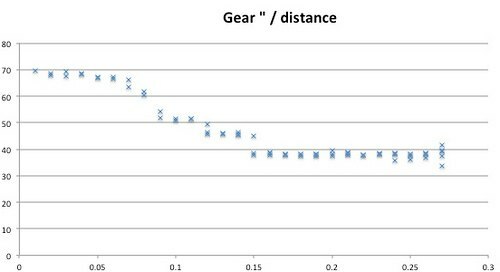 I’d be interested in the maths used to generate gear ” / distance and time by gear ” as I cant seem to get my head round it….! Simon – take a look at http://mccraw.co.uk/graph-gear-inches-time-distance/ for a step-by-step guide to achieving this. Many thanks Dave. Excellent site. I tried your idea. It works great! My duotrap register my cheap cadence magnet without any issues. Can anyone tell me how long a speed sensor should last,Mine just stopped working on a coast to coast ride and could not get it going again. I assume you changed the battery? I recently changed the one in my speed sensor after well over a hundred hours.